I know that some of you have been interested in what I’ve been doing in regards to learning Japanese. Fan translations are a wonderful thing and we have some really talented people out there, but some titles simply won’t ever be available to English-speaking audiences. Because of this I decided it would be worth the effort to learn to understand untranslated media. 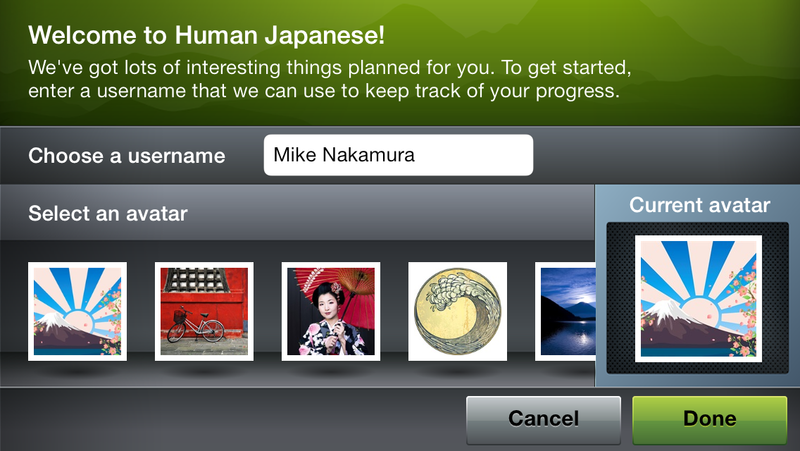 To that end, today I’d like to do something a little different and talk about a Japanese learning app that I’ve found to be incredibly useful – Human Japanese. It’s available on a number of platforms, though my personal experience is with the iPhone/iPod Touch version. As a bit of background information that you may already know, I’m currently studying at university. 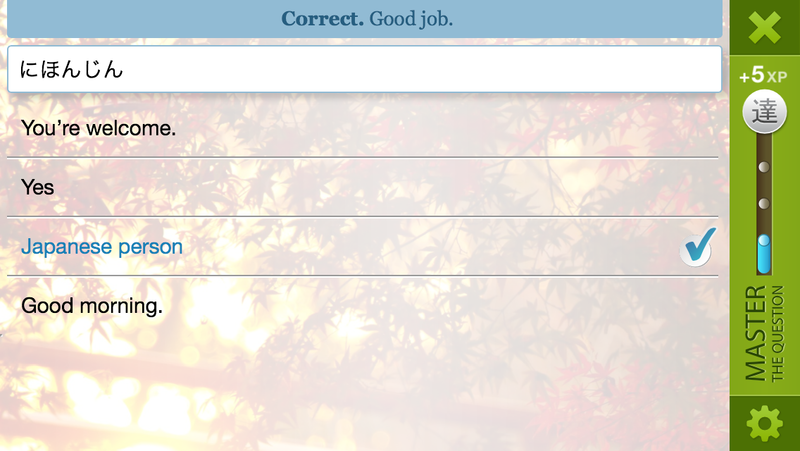 I don’t get a whole lot of free time, so naturally the effort I can put into learning Japanese is similarly limited. Vocabulary is a breeze to learn using flashcards, so the problems began when I tried to get the grammar under my belt. There are some great free resources out there for learning grammar but they don’t come in easily digestible chunks, which leads me to one of the reasons I really like Human Japanese. Even putting just five minutes into reading whenever I get the chance nets me something useful in terms of grammar; the way it’s written is very user-friendly and the information sticks with you. Alright, so I like the app, but what is it? 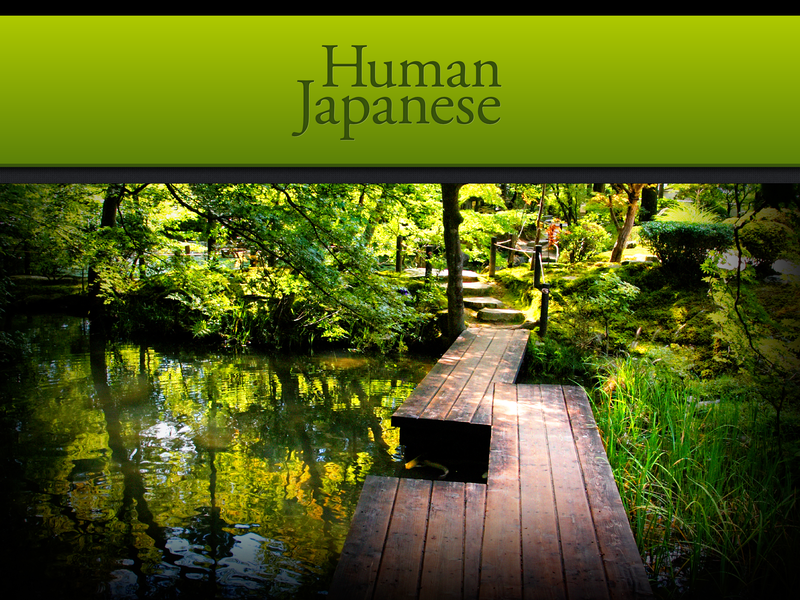 Human Japanese is like a textbook without all of the formality you might associate with one. You read through chapters of information presented in a casual style that you might get from a teacher you really click with. For this first instalment (for those who are really keen to learn Japanese there’s Human Japanese Intermediate which comes after) you’ll pick up Hiragana and Katakana, the basic “alphabets” of the language, as well as all the grammar you need to hold basic conversations. In addition to those aspects, there are culture-focused chapters interspersed among the others that explore various aspects of life in Japan to keep things interesting and relevant, with some dazzlingly high-quality images to boot. I’d love to see more of them but what’s there is still very fun to read. I do have some minor concerns about some of the material and I’ll tackle those at the end of the review, but for the moment you should just know that this is a remarkably engaging learning experience; the information is presented in an order that’s logical and conducive to learning, with each chapter tying in nicely with the next. Now I’ve said that Human Japanese is like a text book but that’s not entirely true as it goes above and beyond what you might be able to offer on paper. To begin with, the examples used (and there are tons of them, often including grammar from past chapters as well) are all fully voiced. If you’re ever not sure of how a word or phrase fits together, you only need to tap or click on it. On top of that Human Japanese boasts a unique feature known as “Ingredients”. In the corner of each example is a small box that can be accessed to provide a detailed breakdown of each component of a sentence and what it means. If you’ve forgotten a particular aspect of grammar it can be an invaluable resource. Finally, a review wouldn’t be complete without taking a look at the app’s interactive components. Each chapter that you complete offers both a chapter review (for concepts covered in that chapter) and a vocabulary review in the form of multiple choice questions. The vocabulary reviews can be accessed at any time in order to practice the words, though there’s currently no way to select specific words you’d like to be quizzed on which means that you’ll find yourself repeatedly answering questions you already know (though that may just be a personal problem for me, as I already knew a lot of the vocabulary). Having said that, the questions have a system where five correct answers means you have “mastered” that question, which I assume will make it come up less frequently. If you find there’s a specific set of questions you’re getting wrong repeatedly then there’s a “most missed questions” mode which may be useful. I should quickly mention that there’s a level system where each correct answer nets you some exp but as there are no benefits to leveling up (and it takes a long time to do so) it’s not a feature that added to my experience. 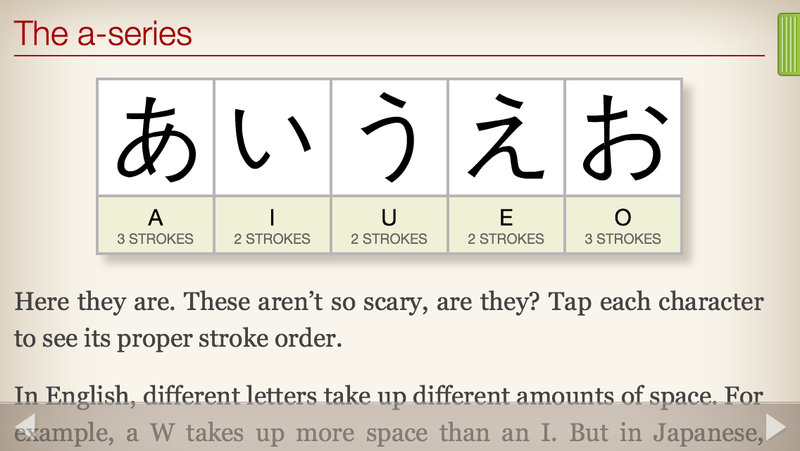 I started Human Japanese with a fairly large amount of Japanese vocabulary under my belt, so I found using the app to be smooth and easy because I already knew all of the words that were being used and had already memorized the two “alphabets” on offer. Because I’d already had some exposure to the language I can’t really tell you what Human Japanese is like for someone completely new to it. However, I’d like to think that with a little bit of extra work learning the vocab as you progress (a feature that teaches you and quizzes you on vocabulary before the chapter it’s used in would be great), your experience would be just as enjoyable as mine. Summary – The bottom line is that Human Japanese is easy to use and fun to learn Japanese with. It’s presented well and has a number of unique features to enhance your learning experience. The inclusion of awesome culture-centric chapters will help keep you interested in what you’re learning as you progress, though the material is written in a manner that won’t bore you in any case. I’m not entirely sure how effective a resource it is to start learning Japanese from scratch with but it’s probably something everyone will find useful at some stage in their learning. I highly recommend Human Japanese. Score: 9/10 – Great – Pretty much everything I want in a Japanese learning app, though there are some small additions I’d need for it to be perfect. This entry was posted in Editorials, Reviews and tagged app, Human Japanese, Japanese, Japanese learning app, learn, learn japanese, Review. Bookmark the permalink. Seems useful. How would you compare it to normal practice – reading VNs while supported by ITH and Translation Aggregator (mainly Edict)? How has Steins Gate been? Looking forward to your reviews. I’ve actually finished G-Senjou no Maou. It was just as good as I remembered – which I think goes to show that what makes it great are its themes and characters, not merely its thrilling and twisting plot. The ending, in particular – my god. I wrote a review, but it was written pretty hastily, in the aftermath of the epilogue, and not terribly good. GSM is just one of those VNs where you have a thousand things to say and words can convey none of them properly. I’m up to chapter three and it’s been good so far. I’m not on the edge of my seat or anything but I think there’s a lot of potential for a great story. I’m really looking forward to re-reading G-Senjou no Maou. It’s been nearly two years since I read it now and I can still remember how much I loved it. Apologies for my ignorance, but do you have a blog up somewhere? Or did you just write the review for the heck of it? Did you read a Japanese grammar guide? I’m actually liking Ixrec’s – utterly compact. I’ve checked out both Ixrec’s and Tae Kim’s grammar guides and think they’re pretty good. You’re probably right about the hour’s study, but they’re not very accessible for the few minutes here and there that I get to study Japanese, which is where Human Japanese really excels. It’s also written in a non-formal, easy to understand manner. I’ll power through your blog when I get some spare time! Probably this weekend. With the advantage of each chapter (Particles, Conjugation) being able to fit into perhaps an hour’s study every weekend! Personally, I done it the traditional way by getting a bunch of text books (Genki is typically used), study the grammar rules and then practice by conjugating words or writing sentences and then post them on Lang8. 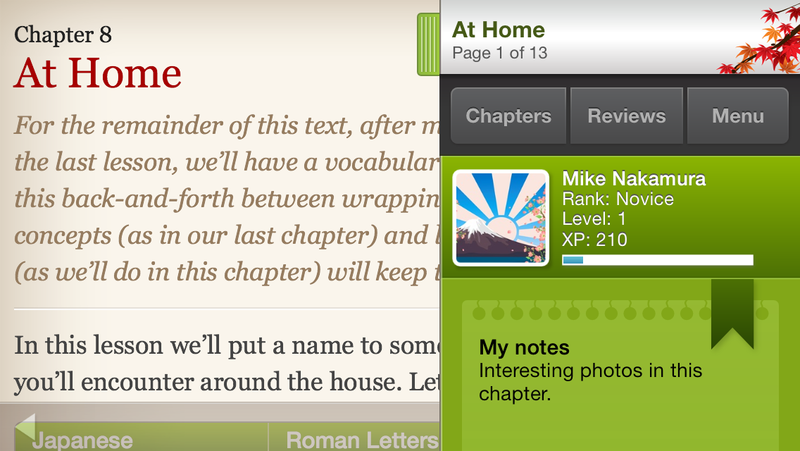 Still, an idea of an interactive textbook is a good idea for those who are self-studying. While it won’t be no help for me now since I already finished Intermediate and now focusing on Advanced (which reminds me I need to focus more on writing essays in Japanese). As for vocabulary, I highly recommend Anki, which is a flash card program that automatically schedules what cards to study. I find it very useful in memorizing vocabulary and Kanji (along with the radicals). They also have applications for Android and iOS devices (the Android version has more functionality such as TTS support). Generally, I play video games in Japanese as supplemental practice and find new vocabulary. I’ll admit that I haven’t given traditional textbooks much of a try. I could kick myself for not having done Japanese back in high school when I had the chance but at the time I wasn’t interested in anime >.< I'm sure that with a lot more effort on my part I could make some good progress with other more detailed resources, it's just unfortunate that at the moment I can't really put in that effort. I'm very jealous of the level you've gotten to (and respect the amount of work it would have taken! ), have you taken the JLPT before? Vocabulary-wise i've found a very good website called Memrise, which is a lot like Anki but slightly flashier I guess (both are free, both feature user-made content and both have audio files, I think). 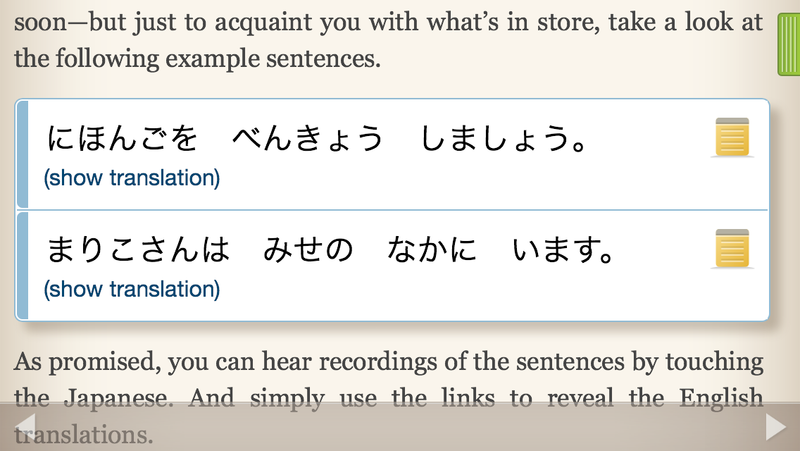 Where they're different (and I may be wrong here – it's been a long time since I last looked at Anki) is that Memrise makes use of IME software so that you input the Japanese yourself and are marked on it rather than self-marking with flashcards. 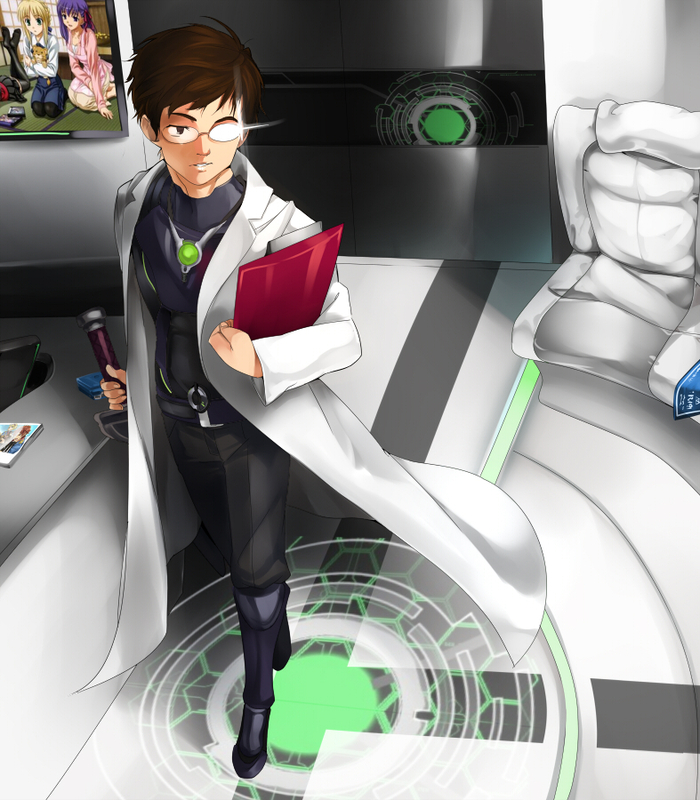 I plan to start playing visual novels when my workload frees up at the end of the year (only 7 weeks to go!). I do plan on taking the JLPT in the future, most likely N3 and skipping the beginner level stuff. I still need to polish up on Kanji and listening as I already know most of the grammar. But as one progresses to higher levels, especially Advanced, there won’t be any English translations and everything is in Japanese (including the explanations, words and such). I noticed this in intermediate with the readings and practice questions/role play are only in Japanese, but the grammar explanations and vocabulary have English. 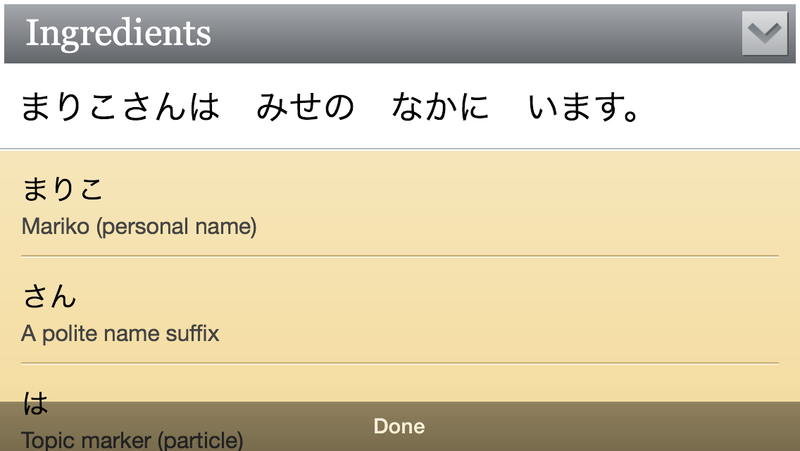 As for Anki, it’s possible to use the system IME to input Japanese. I use a plugin that generates TTS audio files using the built in TTS engine in OS X since I learn better from listening. There is also an option to input the answer, but I decided not to do that. But aside from that, the main reason I stuck with Anki since it can sync all the decks to the web so one can study on any devices.